Today is a grey day here in The Netherlands. 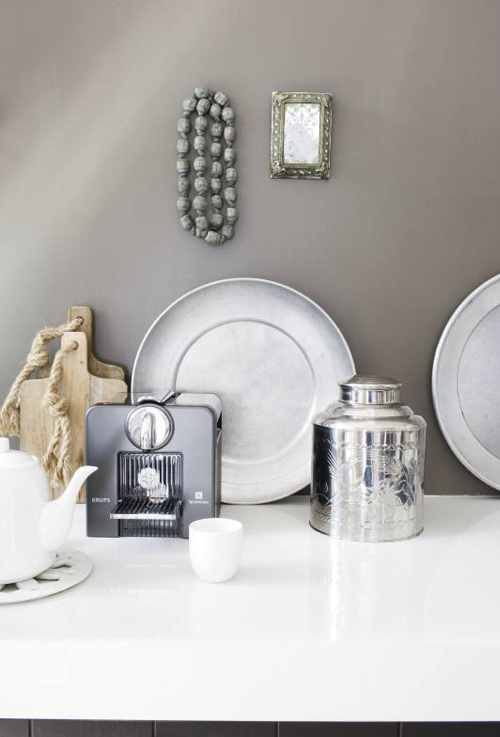 This inspired me to show you various shades of grey (image from AnoukB & & Marjon Hoogervorst / Taverne Agency). 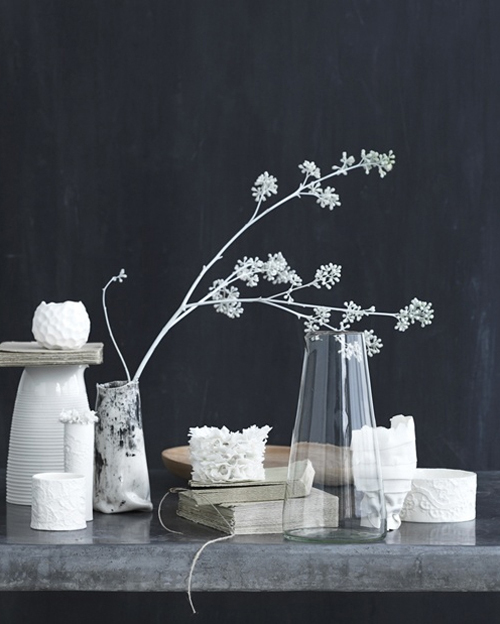 The white flowers and ceramic objects make a beautiful contrast with the dark grey wall (image from Lerkenfeldt Photography). 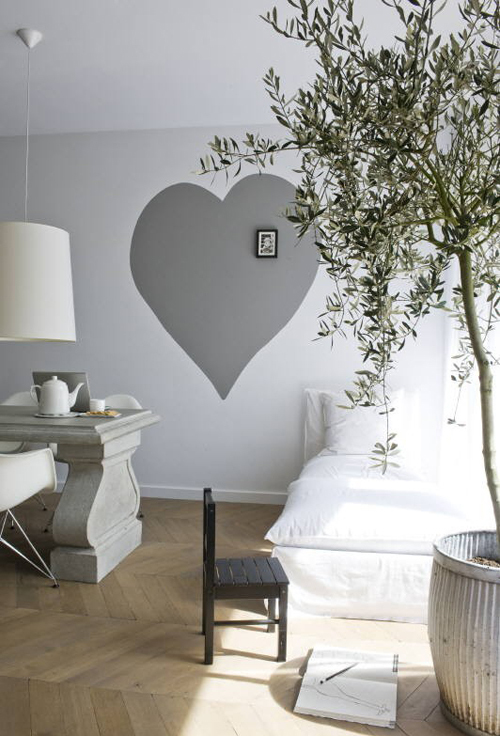 A grey heart gives some color to a white wall (image from AnoukB & & Marjon Hoogervorst / Taverne Agency). 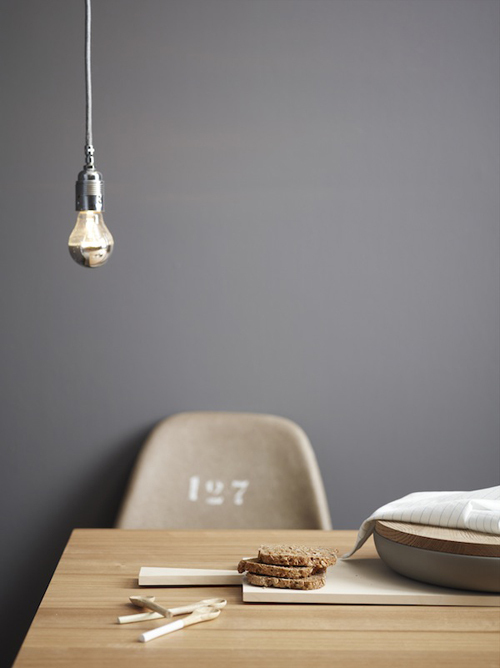 The grey paint in the image above is from Jotun’s collection (via Emmas Designblogg). Ondanks dat ik niet echt vrolijk word van de grijze lucht vandaag, vind ik het wel een hele mooie kleur voor in huis. Het is ook zo goed te combineren. This is a post after my own heart. I love grey! My hallway is painted ‘Metropolis gray’ and my bedroom is a pale blueish grey. I love the lamp on the fourth image..
How can something so austere be mouth-wateringly lush? Love the shades of grey and white . Its given me an idea. I have 2 white pics Imade on my wall .I think a border of grey painted on the wall would set them off !!! your interior style is SO TASTY!! i can hardly stand it! i wish i could ‘follow’ your blog so it updated in my blogger dash. Oh man, you’re definitely bookmarked! These are stunning greys, beautifully paired with whites and silver, so simple and clean. Waouw this first grey is so soft… do you know about the reference??? thanks!! Such lovely images especially that amazing grey heart. I don’t know why people shy away from grey as those rooms are beautiful. Nice to see different ways to incorporate a bit of Greige into the home. That’s my favourite colours – more please!